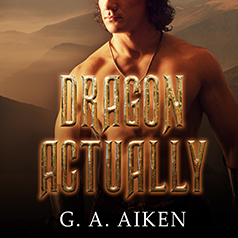 G. A. Aiken presents Dragon Actually, the first book in the Dragon Kin series. It's not always easy being a female warrior with a nickname like Annwyl the Bloody. Men tend to either cower in fear—a lot—or else salute. It's true that Annwyl has a knack for decapitating legions of her ruthless brother's soldiers without pausing for breath. But just once it would be nice to be able to really talk to a man—the way she can talk to Fearghus the Destroyer. Too bad that Fearghus is a dragon, of the large, scaly, and deadly type. With him, Annwyl feels safe—a far cry from the feelings aroused by the hard-bodied, arrogant knight Fearghus has arranged to help train her for battle. With her days spent fighting a man who fills her with fierce, heady desire, and her nights spent in the company of a magical creature who could smite a village just by exhaling, Annwyl is sure life couldn't get any stranger. She's wrong . . .